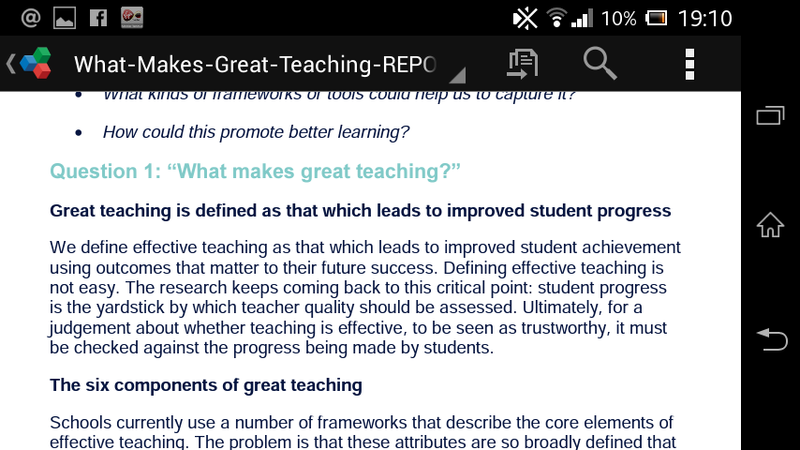 Today the Sutton Trust report “What makes great teaching?” by Rob Coe, Cesare Aloisi, Steve Higgins and Lee Elliot Major was released. It’s a report I’ve eagerly been awaiting and I very much enjoyed reading it. You can download the report in full here free of charge. It’s only around 50 pages long and I’d say read it, but if your lacking in the time or the inclination I would say you should definitely still download it, and read the executive summary which is only around 3 pages long. This executive summary is a brilliant summary of the report, so I feel no need to summarise it here, but there are a few points I’d like to comment on. Great teaching is defined as that which leads to improved student progress. That, to me, seems the most obvious thing in the world. If the pupils are progressing well in your subject, then the teaching is great. If the students aren’t progressing, then you need to look at what’s going on and put things right. Unfortunately, this hasn’t been the case in recent years. I’m glad that this report, and recent ofsted guidance, is signposting a move away from the idea of preferred teaching styles and single lesson judgements. Different things work for different teachers, and different things work for different classes. Context is key. There’s a wealth of ideas and things research suggests works in this report, and I’d suggest trying it out, I will be, but you need to always bare in mind that things that work elsewhere won’t always work for you. Another key point I noted was the strength of evidence to say that Pedagogical Subject Knowledge was important, especially in maths. This is something I’ve written about before, and again something that seems obvious. Yet I’ve often heard people say “If you can teach, you can teach anything.” I’ve experienced in my own education teachers that were one page ahead in the text book and it wasn’t effective. We need to ensure our pedagogical subject knowledge is up to scratch, that we know the links between our subject and the misconceptions likely to occur. This is particularly important now, as we are in the middle of massive curricula reform which will see a large amount of teachers teaching topics they haven’t taught before, and we all need to make sure we are prepared. A strong theme throughout the report is around observations. 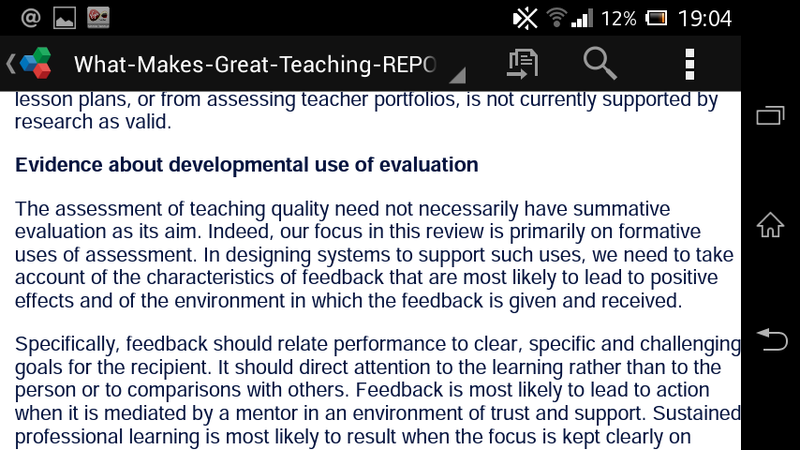 The report seems to favour heavily the idea that they are most effective when done in a formative developmental way. These are ideas I like. I think all teachers should be constantly developing, and striving to improve. 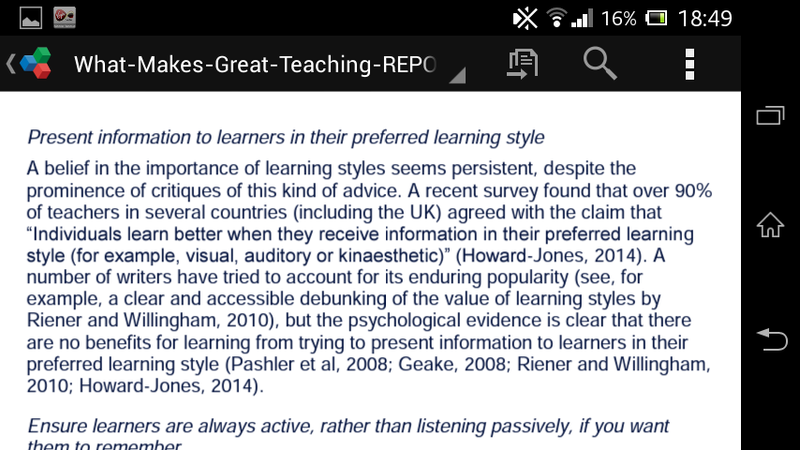 Hattie’s research suggests that there us a massive positive effect on outcomes when teachers see themselves as learners and this backs that up. 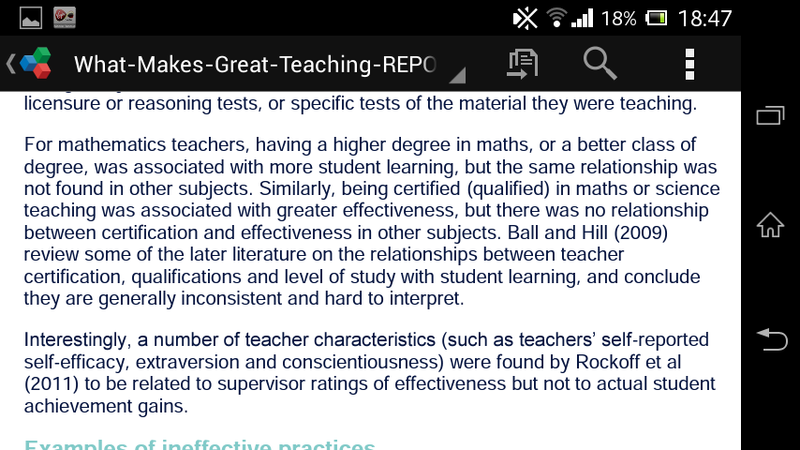 I’ve noticed an uptake in the number if teachers I know undertaking further study, and this can only be a good thing. The report talks about creating a culture where teachers are comfortable discussing their shortcomings, and working to improve them. But if they are tied to pat progression then teachers may not feel comfortable owning up to them. Which is terribly worrying given the weight of evidence against then. It’s easy to find a bucketload but here’s one to start you off. As you can see, there’s a wealth of fantastic stuff in the report, these are just a few key themes I’ve picked out that interest me. The mainstream media seem to think the main theme is about “lavish praise” but that’s just a tiny part! If you have strong views on any of this, or anything else in the report, I’d love to hear then. I’ve just finished watching ITV Tonight’s episode from this evening entitled “Trouble with numbers”. The show was highlighting the problem we have in this country with maths ability in Adults. I found it pretty interesting, and if you missed it I would certainly suggest catching up on it. 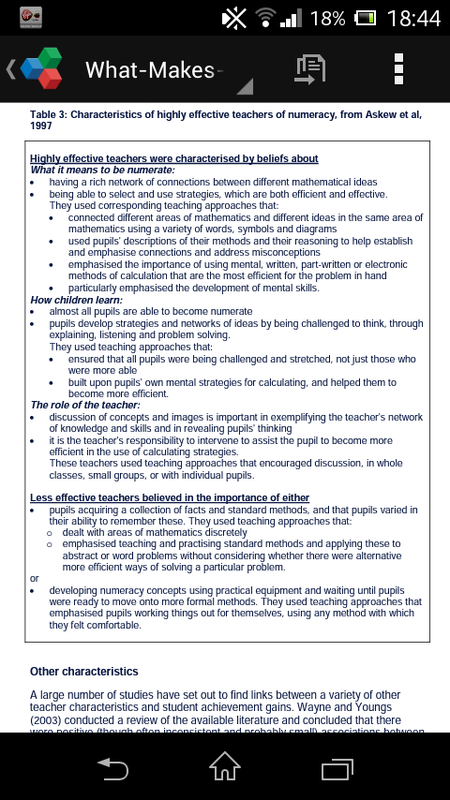 There were a number of things highlighted in the program that we maths teachers already know, but are major issues. Firstly, the fact that the culture in this country finds it perfectly allowable for adults to say “I can’t do maths.” This is a real issue, and last year a number of my year 11s were told this by the head of English, which led them to question the necessity of maths as you could be a head of English while being rubbish at it. The second point was the fact that learning happens with mistakes. This seems obvious to me, and I have long worked to build a culture in my classroom that it’s fine to be wrong, as that’s how you learn. But the show suggests that this is not the case in the majority of UK classrooms, which is a shame. There were some excellent examples of initiatives being run by various institutions to help improve adult numeracy, and I was pleased to see that they are effective. I was made up to see that the driver for one bloke was that he wanted to be able to help his daughter with her homework. I was also pleased at the take up shown in the school that offered classes to parents. While writing my last masters assignment I looked into the effectiveness of this and it’s something I would like to run in the future. All in all, it was an enjoyable show, although I would have liked it to be longer. And I was slightly annoyed that when they were revealing the scores of the kids vs parents exam they referred to the “average” score, rather than the “mean” score. I’ll leave you with the worrying fact imparted by Jo Boaler on the program: Girls maths performance drops instantly if their mum tells them she was never any good at maths. My daughter is now a little over two, and as such I spend quite a lot of time at children’s play parks and the amount of maths you can find there is incredible. I’ve written along these lines before. From silly things, like the fact our local park was the only place I’ve seen with a simple abacus that’s set up for a base ten, rather than base 11, world. 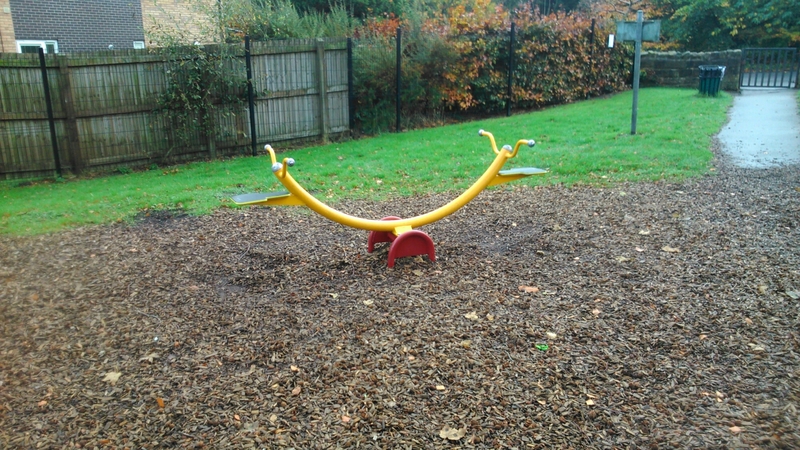 To the more intricate mechanics behind swings and roundabouts. “A slide?” I hear you thinking. “Surely there’s nothing too mathematical about that? Gravity means you go down it.” Well in some respects you would be exactly right. However, we don’t live in a model world, and there is the question of friction. Today the park was rather damp, it had been raining over night, so we took a towel to dry the slide. 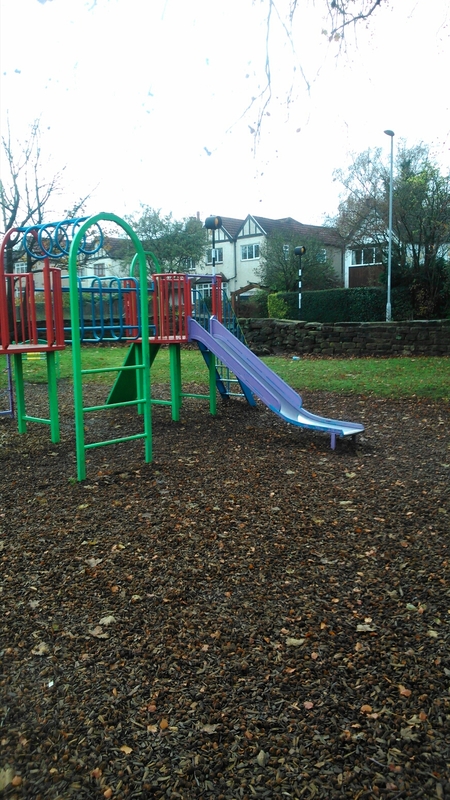 Once the slide was dry my daughter went down it, but at an incredibly slow speed and stopped about halfway down. I have always noted that the speed of the slide varies incredibly, and had assumed it was due to the coefficient of friction varying between different materials. Her cotton trousers provide a much faster slide than her jeans, for instance. But today she had denim on and it doesn’t normally stop halfway down. I then thought about another recent trip where the slide had seemed slow, and that day it had been particularly warm. It got me thinking, does the temperature affect the coefficient of friction between two materials? Or perhaps it’s humidity that has an affect? A little bit of research leads me to believe that both can be contributing factors. Definitely more ammo for investigation in a mechanics school trip! As you can see, the local see saw is fairly basic and works best if two people of a similar mass are on each end (obviously we aren’t). It’s still easy enough to work, but it made me think about another local-ish park that has a much more complex see saw where there are 3 seating positions on each end. That gives more variability to the user’s and would mean two children of different mass could select positions,that give similar, but opposing, moments and hence work the see saw as well as if they had equal mass. What a fantastic idea, and a fantastic use of maths! I love the amount of maths that is present at local playparks, and one day I do hope to take a mechanics trip (perhaps a cross curricular one with physics) to investigate all these things. It would be awesome to make a TV show around it. Perhaps I’ll make my own Numberphile – esque video on it one day! This post, like many others I’ve read over the last day or so, is inspired by Rob Carter (@robcarter2012) who wrote this post on a similar topic. It’s been a joy to read the posts which have provided much needed respite from the negativity pedal in some areas, such as the dreaded secret teacher. 1: You get paid to talk about your favourite subject. I love maths, I love talking about it and I love doing it. All things that happen as a natural by product of my job. It keeps me engaged with a subject that had been vanishing from my life in the years between university and teacher training and it certainly keeps my brain sharp. 2. You meet a lot of amazing people. Some jobs can be lonely, you can spend the majority of your time in a solitary relationship with your computer. Teaching is not like this, you spend the majority of your time with people, whether they be learners or colleagues. And I’ve met lots of amazing people who are both. No one is the finished product, we are all learning, all the time. There’s always a new piece of policy to implement, an impending curricula change or just a new pedagogical approach that might be worth a try. I’m currently studying towards a masters qualification, which I’m finding extremely interesting, but even without that there are tons of opportunities for continual development. Every day I spend time working with young people to improve their prospects in the “real” world. The world beyond 18. This takes many forms. Teaching maths, obviously, equips some with the basic maths skills they’ll need in life, helps them achieve a qualification that will open doors and secures a good footing for the future. For some it goes further, inspiring take up of the subject at A Level, or higher education. I even had one student go on to do mathematics with QTS which has a knock on effect on a whole host of future pupils. It’s not just that though, helping with UCAS, helping learners decided what course in HE is best for them and writing UCAS references are equally important in making that impact. Then there’s listening, sometimes that’s all that’s required, and sometimes even imparting a little advice, when learners feel they need it. 5. An end to monotony. When I think back to the time of spent in office jobs between university and teacher training I realise just how bored I was. I wasn’t being challenged intellectually and I wasn’t being challenged in any other way either. I had some good people around me, and that made the job enjoyable enough, but I would hate to return to that. I sat opposite a guy called Will who was great. He once said “do you feel your brain melting when doing this job?” we both decided a career change was in order. I followed nt long held dream to teach, and he followed his into the medical industry. I’ve tried to keep this post fairly short and concise. I’ve written before in more detail about Teaching, why I would recommend it and what I think about the much reported downsides here. 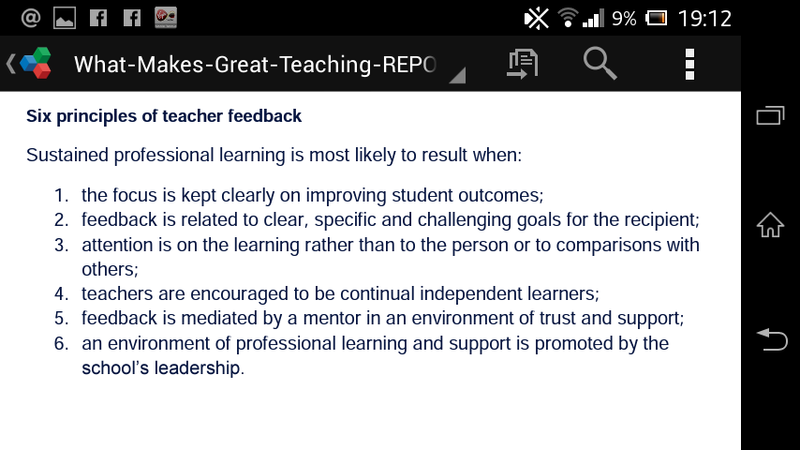 If you’ve written a 5 reasons to go into teaching post, do post a link in the comments or send me it via twitter. I’d love to read them. 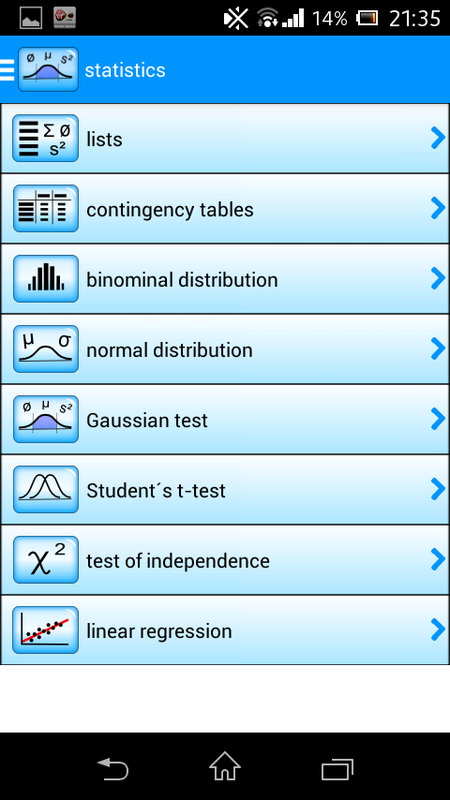 A while ago I blogged about the Wolfram Alpha app, which I love and which has been the limit of my mathematical apps on my phone since. I haven’t really needed anything else. 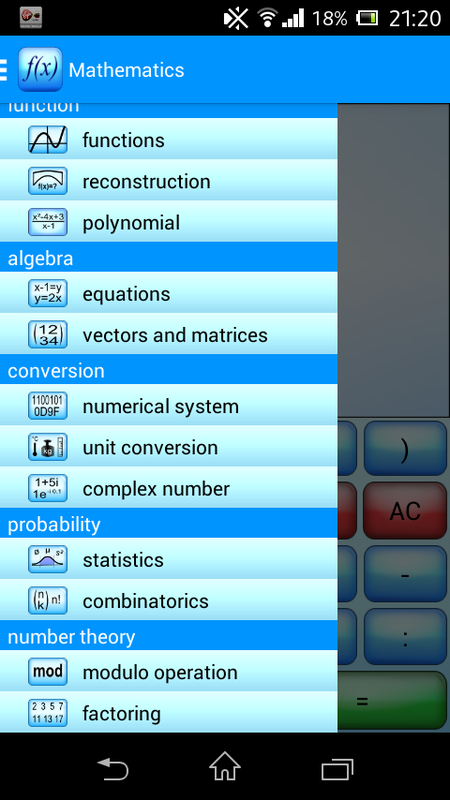 The other day, however, I was on the play store trying to find a decent app which would allow me to type maths easily. I failed in my search (if you know of a good one for android do let me know!) 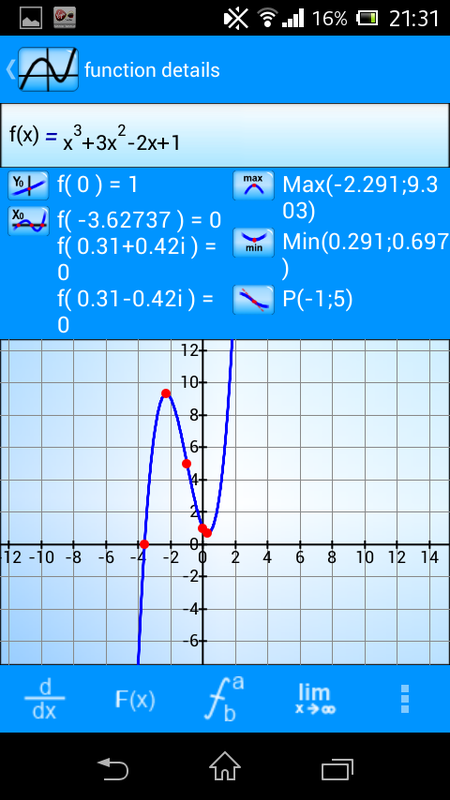 but I did find this app called “Mathematics – for android” by daboApps. What you can’t see are two sections titled “Calculator” and “Calculations”. Which are excellent high powered calculators. So far, I’d certainly say it isn’t bad at all for a free app! This got me thinking about year 9. It’s a funny year group in general. Traditionally it falls within key stage 3, but in many schools these days it us counted as key stage 4. This year’s are in a stranger place still, as they will be the first year to go through the new KS4 curriculum and sit the 1-9 exams. 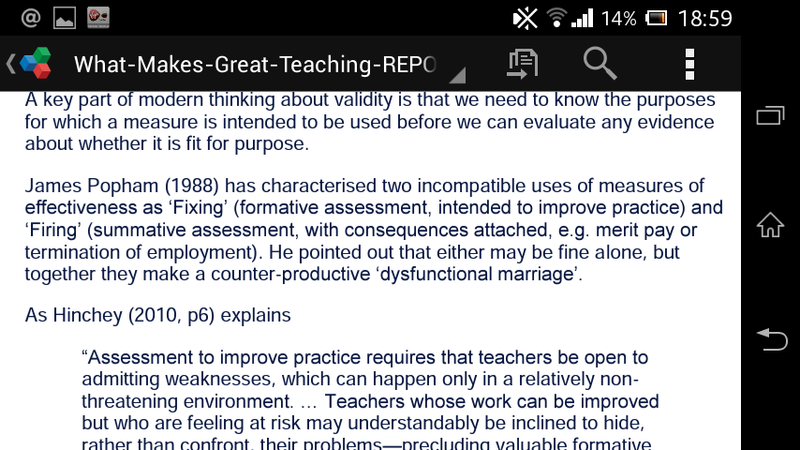 And they will do this without having done the new KS3 curriculum, never mind the KS1/2 curricula. This means they run the risk of having gaps in the assumed prior knowledge where said assumed knowledge is on the new curriculum but not the old. It is important schools address this this year. We need to ensure that we are equipping year 9 with the requirements to access the new curriculum. Edexcel have drafted a transition curriculum for year 9 that is freely available on their website. (I don’t think the other boards have, if you know they have send me the link and I’ll add it!) As all the boards are using the new curriculum with no additional content, this transition scheme should help if you haven’t yet put anything in place. So how should we assess? The answer here is pretty obvious to me. We should be assessing against the content they need to know, identifying the gaps in that content and using that to inform our teaching. I believe that that should be the main focus of all our assessment, particularly with this year group who face extra challenges. 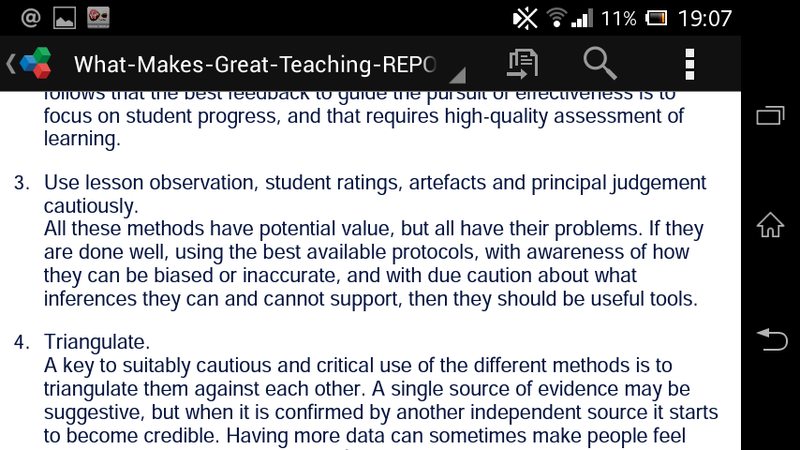 I do, however, feel the question is intended to be about tracking, rather than assessment. I think it’s really asking “should we be using levels, a-g grades or 1-9 grades?” This to me is an entirely different question. And I see it as far less important. We are moving into a “life beyond levels” and I see that as an opportunity to take back assessment. To restore it to its former glory as a way to identify gaps, rather than a way to impose a linear model of progress onto learning that doesn’t take a linear form at all. I know at the recent #TLT14 event Tom Sherrington (@headguruteacher) spoke about the removal of levels from reports at his new school and recently wrote this excellent piece in assessment. Well obviously we need to have some progress tracking, but does it need to have a numerical value every half term? Should we even be collecting data that often? I believe Kev Bartle (@kevbartle) spoke at #TLT14 about how he’s moved his school to 2 data collections per year, believing that this will mean more accurate data, which I think is a good idea. So what should we use? We know, as teachers, what are students need to know to get where they need to be. We know their start points and we know where they need to be at each step. Should we even be quantifying this with numbers or letters? Could we nit be rating them as “On target”, “Above target” “Below target”? In a post level world where progress is king (fingers crossed progress 8 moves us away from a threshold pass!) should we not be assessing against, and reporting on, progress? #mathschat is a twitter chat which happens Wednesdays at 8pm. Follow the hashtag to join in. And feel free to comment here if you have opinions on this, I’d love to hear them. Earlier today I listened to episode 19 of my favourite podcast, “Wrong, But Useful“ (if you haven’t listened, and like maths, then go listen quick!). Every month the hosts Colin Beveridge (@icecolbeveridge) and Dave Gale (@reflectivemaths) set a maths puzzle for listeners to solve. Show that n^4 + 4 is not prime for any integer greater than or equal to two. Have a little go if you haven’t already…. For even n then the whole things even, but what about the odds? Could it be solved by induction? N=3 gives 85. N=5 gives 629. Nothing jumping out there. 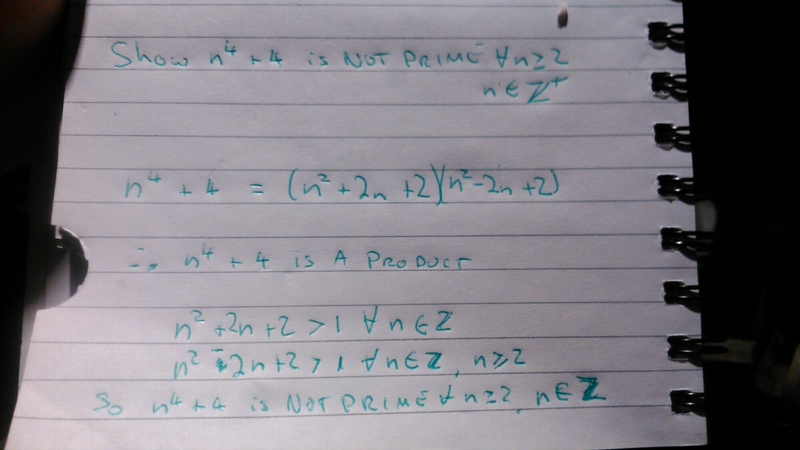 After a brief false start where I wrote the square root of 2 is 1 I came up with the solution, which is quite neat. n^2 – 2n +2 is greater than 1 for all integers greater than 1.
n^2 + 2n +2 is greater than 1 for all positive integers. Hence n^4 + 4 is a product of two numbers greater than 1 for all integers n greater than or equal to two. A lovely little midweek puzzle.